As writers we should take advantage of the excellent workshops and conferences around us. FWA's annual conference is coming up in October, and we need to support that. There's another conference coming next month in St. Augustine, and it also offers first rate speakers and the opportunity to learn and network with your fellow writers. Here's a look at the Florida Heritage Book Festival Writers Conference, September 26-27 at the St. Johns County Convention Center at Renaissance World Golf Village. It kicks off Thursday afternoon with two "Super-Sized" 3-hour workshops. "Stories from Your Life" is presented by award-winning short fiction author Philip Deaver, pictured, who will show us how to adapt real-life situations and characters into fiction. The other workshop, "Quieting Your Inner Critic," with writing and yoga instructor Lezlie Laws, covers specific ways to turn your life around if you're feeling frustrated and find it hard to write. Conference registration includes the reception that evening and keynote talk by New York Times bestselling author Andrew Gross. 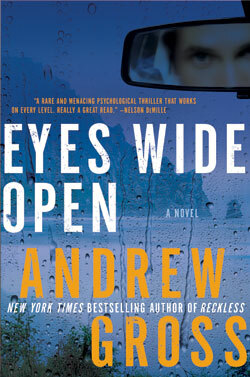 Gross wrote six #1 thrillers (Judge & Jury and Lifeguard, among them) with James Patterson before going on to write his own bestselling thrillers including Eyes Wide Open and 15 Seconds. He's titled his keynote talk "Why Thrillers Matter." The reception and keynote may be purchased separately by the general public, but are included with the conference registration. establishing your own independent publishing business, and several marketing sessions. One of the key features is the luncheon with keynoter Tim Dorsey. Dorsey, pictured at left, is the bestselling author of the Serge Storms thrillers, and his talk is titled, "Florida: A Target Rich Environment for Writers.". Registration covers lunches for both days, Friday's continental breakfast and the Thursday evening reception and keynote by Andrew Gross. The Early Bird discount price of $125 covers both days and is available through September 10 only before increasing to $150. So it's best to register now. Or you might consider the Complete Package registration which includes Friday night's reception and Literary Legends Banquet honoring internationally known author John Jakes. Jakes is the author of more than 50 novels and 200 short stories, including the acclaimed series, The Kent Family Chronicles and North and South, both of which were made into television miniseries. The Early Bird registration fee for the conference and banquet is $195, and increases to $215 after September 10. Visit this page to complete your registration. River City Writers meets Tuesday, September 10 at 7:00 p.m. at the S. E. Branch Library. Group leader Gregg Golson has more details. Nassau County Youth Writers meets Tuesday, September 17 at 5:00 p.m. at Books Plus in Fernandina Beach. Open to all young writers. See below for some of the exciting activities Jim Weinsier's group is undertaking. Amelia Island Writers assemble for their monthly meeting immediately after the Youth Writers on Tuesday, September 17, 6:15 p.m. at Books Plus. Contact group leader Maggie deVries at 904-321-6180 with questions. Be part of the Clay County Writers meeting on Wednesday, September 18 at 6:15 p.m. at the Orange Park Library when author and former FSCJ writing instructor Howard Denson presents, "The Wrong Stuff: Findings of a Forensic Grammarian." your fearless leader will be in Lake Mary, there will be a combined meeting of the PV Writers and the Ancient City Writers on Saturday, September 21, 10:00 a.m. at the St. Augustine Main Library. Our special speaker is Mark Ari (call him Ari), a very creative man who wears many hats. Ari is leading a Flash Fiction workshop he calls "The Wink of Immediacy." Flash covers a wide range of possibilities in fiction and creative nonfiction, and Ari will lead us through some of them. Be sure to bring paper and pen with you. Ari publishes fiction, poetry and nonfiction. His work has appeared in many literary journals and he edits and produces a series of digital audio chapbooks, along with teaching creative writing at the University of North Florida. Jax Youth Writers will gather on Thursday, September 26 at 7:00 p.m. at the S. E. Branch Library. Kimberly Smith has more information. FWA affiliate First Coast Christian Writers is still meeting each Thursday at 6:45 p.m. at the Webb-Wesconnett Library. As mentioned above, the Nassau County Youth Writers group is staying busy this summer. Group leader Jim Weinsier reports the young writers will be writing a regular column for the Fernandina Beach News-Leader, as well as working on a pre-K book to be distributed by the library and Family Support Services. Contact Jim if you know a young person who would like to be involved. Florida Sisters in Crime members meet Saturday, September 7 at 10:30 a.m. at the S. E. Branch Library to hear from Jimmy A. Holderfield, Director of Dept. of Corrections, Jacksonville Sheriff's Office. Visit their website for more information. First Coast Romance Writers meets Saturday, September 14 at 10:30 a.m. at the Chaffee Road Library. Romance author Amy Atwell will present two workshops beginning with "Staging the Multiple Character Scene," and ending with "All About Amazon." Ancient City Romance Writers welcomes JSO Detective Tommy Herrington for a Q&A session on Saturday, September 28 at 11:00 a.m. at the S. E. Branch Library. conference officially cranks up, bestselling romantic/suspense novelist Mary Burton, pictured, leads the pre-conference workshop. Also, for the first time ever, FWA is holding a conference for Youth Writers to be held on Saturday, October 19 at the Orlando Marriott in Lake Mary. 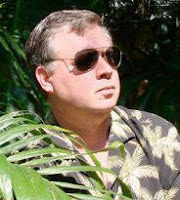 One more item of interest: Jacksonville's own Michael Wiley, award-winning author of the Joe Kozmarski Mysteries, is this year's Person of Interest for FWA Collection #5, It's A Crime. He's selected his Top Ten and will be a keynoter at the conference as well as presenting a crime writing workshop on Friday morning. Check out the schedule and be sure to register for "The Greatest Writers Conference on Earth." Clay County Writers and Black Horse Winery present another Meet the Authors evening on Tuesday, September 10 from 6:30 to 8:30 p.m. at the winery, 420 Kingsley Avenue in Orange Park. Featured authors are Howard Denson, Timothy Gilmore and J. Dianne Tribble. Janet Walter, the former leader of the local chapter of SCBWI, Society of Children's Book Writers & Illustrators, is looking for a critique partner to exchange manuscripts and offer critical feedback. If you're interested, contact Janet at jgwalter@comcast.net. Editor Beth Mansbridge facilitates the Professional Writers Group on the first Thursday of each month (except December) from 5:00 to 8:00 p.m. at the St. Johns County SE Branch Library, 6670 U.S. 1 South in St. Augustine. To learn more, contact Beth at beth@mansbridge.net. Congratulations to FWA members Terry Williams and Vic DiGenti (writing as Parker Francis) whose books are finalists for the 2013 President's Award from the Florida Authors & Publishers Association (FAPA). Terry was recognized for his military thriller Cooper's Revenge. 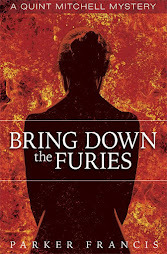 Parker's second Quint Mitchell Mystery, Bring Down the Furies, was chosen in the Adult Fiction — Mystery category. The winners will be named at the President Awards Banquet on September 21 at the annual FAPA conference in Daytona Beach. Until next time, keep reading and keep writing. Hope to see you at one of the upcoming meetings or conferences. Chapters to write. Edits to make. Conferences to attend. And guests are on the way. Somehow, it looks like August may be one of the busiest months of the year, so let's not waste any time. Here's what's happening this month and beyond for NE Florida writers. Dive in, the water's fine. 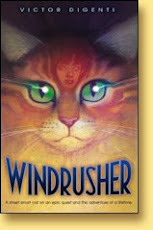 River City Writers meets Tuesday, August 13 at 7:00 p.m. at the S. E. Branch Library. Group leader Gregg Golson can give you more details. Email him at gtgolson@comcast.net. 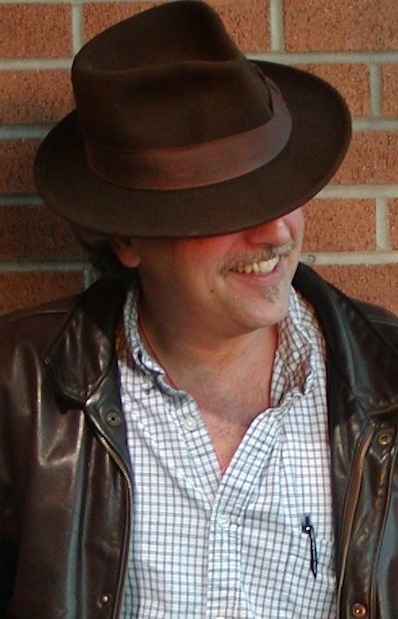 The Ancient City Writers welcome the return visit of Rik Feeney on Saturday, August 17 at 10:00 a.m. at St. Augustine's Main Library (next to the carousel). Rik's topic is "Titles, Covers, & Back Cover Copy Blurbs." He'll talk about these keys to good design and how they help sell your book. Nassau County Youth Writers meet Tuesday, August 20 at 5:00 p.m. at Books Plus in Fernandina Beach. All young writers under the age of 18 are welcome. Adult writers can join the Amelia Island Writers at Books Plus on August 20 immediately following the Youth Writers at Books Plus at 6:15 p.m. Bookstore proprietor Maggie deVries is also the group leader. You may reach her at 904-321-6180. If you're an Orange Park writer, then you'll want to join the Clay County Writers meeting on Wednesday August 21at 6:15 p.m. at the Orange Park Library. Area author Chris Berman presents "Believable Fiction Using Fact-Based History to Build Your Story." Contact Maureen Jung for more details. Jax Youth Writers, under the leadership of Kimberly Smith, meet Thursday, August 22 at 7:00 p.m. at the S. E. Branch Library. There will be no meeting of the Ponte Vedra Writers at the Ponte Vedra Library this month due to extenuating circumstances involving too much to do and to little time. Please attend one of the other FWA meetings. It's being called "The Greatest Writers Conference on Earth," FWA's 12th Annual Conference, October 18 - 20, 2013. Perhaps a bit of hyperbole in the title, but FWA's conference always offers quality workshops by qualified professionals. You may pitch to agents, publishers and editors and attend the Royal Palm Literary Awards dinner. Once again held at the Orlando Marriott Lake Mary, it's an easy drive of less than two hours and definitely worth the investment of time and money. Register now. Click here for more information. Closer to home and one month earlier is the 6th Annual Florida Heritage Book Festival & Writers Conference, September 26 - 28. The event combines writers workshops, opportunities to meet bestselling authors and much more. The Writers Conference, September 26-27, offers extended 3-hour workshops on Thursday and a full-day of 1-hour workshops on Friday covering both the craft and marketing of writing. Conference registration includes lunches, breakfast on Friday and keynote talks by Andrew Gross and Tim Dorsey. The literary Legends banquet on Friday evening will honor John Jakes, award-winning historical author of mega-selling books like the North and South trilogy and The Kent Family Chronicles. All of this takes place at the St. Johns County Convention Center at Renaissance World Golf Village Resort in St. Augustine. Here's the conference schedule and registration information. In case you're looking for even more conferences to attend, FAPA, the Florida Authors & Publishers Association, presents its Fall Conference, September 20-21 at the Daytona Beach Resort and Conference Center. More info here. If you haven't made your RSVP already, it may be too late to attend the Florida Sisters in Crime workshop with Georgia author and former police officer Jaclyn Weldon White this Saturday at the S. E. Regional Branch Library. Jaclyn will present two workshops on writing suspense and true crime beginning at 10:30 a.m. with a break for lunch. Contact Pam Wells for additional information. If you're thinking of writing a romance novel you may want to attend the August 10 meeting of the First Coast Romance Writers. The group is holding an open house to acquaint writers with the Romance Writers of America and the First Coast Chapter. It starts at 10:15 a.m. at the Chaffee Road Library. Beth Irwin has the details. The Clay County Writers group teams up with Black Horse Winery once again to present another Meet the Authors program. This one starts at 6:30 p.m. at the winery, 420 Kingsley Avenue in Orange Park, and features authors Russ Kamradt, Sandi Gordon, Sonserra Hayden and Tracy Maxwell. Ancient City Romance Writers welcomes editor Kathleen McMajon on Saturday, August 24 at 1:00 p.m. at (you guessed it) the S. E. Branch Library. Kathleen's subject is "Editing the Way an Editor Sees It, AKA: Don't Shoot the Messenger." Kathy Bain has more info. June Weltman teaches her mystery writing class again, starting September 12 at Mandarin High School. The 8-week course, "Writing Mysteries for Children and Teens," is part of the Duval County School Systems Adult Education program. Email June at mirandamanning@aol.com about registration details. The Florida Book Awards is accepting entries for this year. 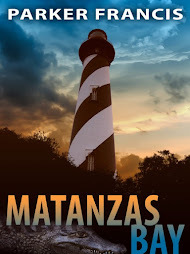 Any Florida author with a book published in 2013 is eligible. Check out all the categories and submission details at their website. Former diplomat and consul John Tinney's memoir, From the Inside Out, has been published by the Association for Diplomatic Studies and Training and New Academia Publications. Nancy Murray's newest book, The Madonnas of St. Augustine, is a finalist in the 2013 International Book Awards, and has received the Seal of Approval from the Catholic Writers Guild. Cheri Roman announces the launch of her debut novel, Descent (Book One of the Raphaim Series) with a launch party on Saturday, August 31 at 2:00 p.m. at the Bartram Trail Branch Library. 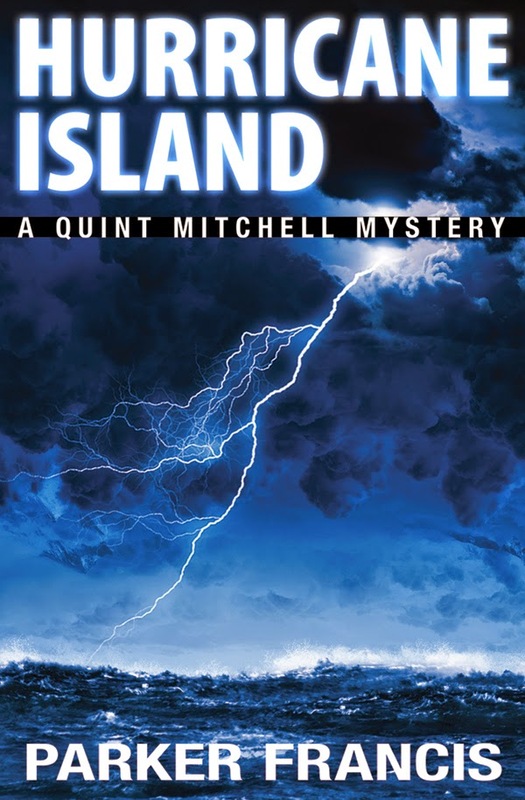 And congratulations to St. Augustine thriller writer Steve Berry. Steve was honored at the International Thriller Writers annual conference with the 2013 Literary Silver Bullet Award. Time is short so I'll leave you with these short cuts. W. Somerset Maugham said, "There are three rules for writing a novel. Unfortunately, no one knows what they are." Enjoy the last month of summer, 2013.